While deleting the futile files to free some space, along with some important files accidentally gets deleted. 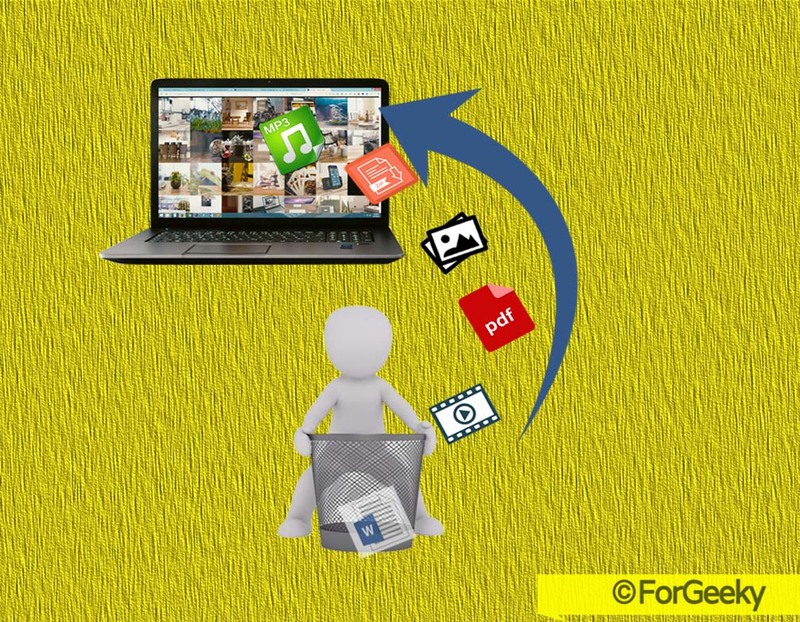 After deleting the files permanently with a shift + delete key, those files won't be visible in your computer's storage, also no longer exists in the trash and recycle bin. Yes, we all are doing such a goof once in a life. Once the data is lost, people become embarrassed and thinks their computer is worthless but, the proper knowledge make them happy again seriously. Hard drive data recovery is possible. You could restore them back again. Should Do First: - After the data loss happens, It's better to stop using the computer to avoid the copy, paste and update operations to evade from the overwriting. This will keep your deleted file more safely. 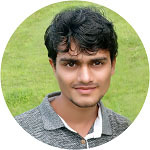 Why the Deleted Files can be Recovered? Actually, the deleted file's data (zeros and ones) are currently available on the sector until and unless that data become overwrite with a new file. Just visualize you have a book of 100 pages with ten chapters, all books having the index page at the beginning which describes the where the particular topic is located. If you remove the last index, not a content page other readers by looking index page will things that the contents of that page not available but it's really. It's just simple than you think. Removing only the pointer and marking that space is free is very swift operation. If it does not do so, for deleting the 5GB of data requires time as that much required for writing 5GB of data on your hard disk. Want to test?, Try to format your any USB and uncheck the quick format option. Quick formatting is done within the few seconds only, but the full format takes much time depending on the size. Nearly that much for writing it completely. For faster the performance and to save the time, all operating system doesn't erase the files quickly except from the SSD (cover more at end of this article). To restore deleted files, there are thousand plus third-party recovery tools available on the internet, A good recovery software shows the preview and details of deleted files before the recovery. Here I listed the best free Recovery Softwares based on my using. Recuva is a very powerful free recovery tool from piriform Ltd, the same organization who developed the popular disk utility tool CCleaner. 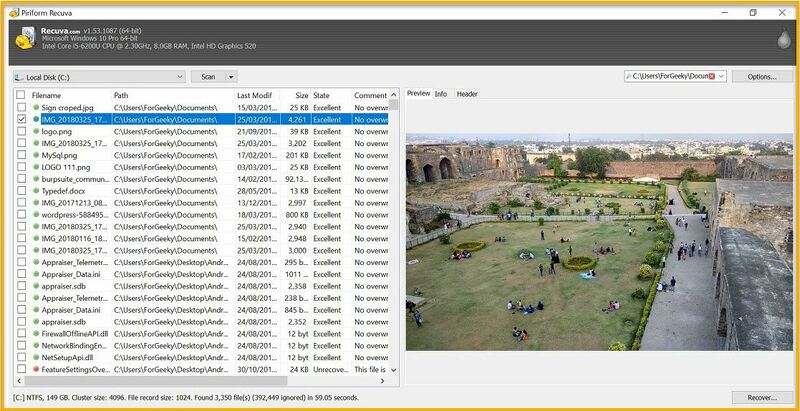 It scans the deleted files in very short time, as well shows the preview and details of the deleted file before the recovered. Recuva can undelete data from external USB drives, memory cards, iPod, CD/DVD discs even if they are corrupt, damaged recently formatted! It shows file's condition before of recovering. Recuva also tells the whether the files are overwritten or not, if they are, it shows the name of those files. It supports the larger drive also. I strongly recommend to use Recuva to restore your files. It's another handy recovery tool. Disk Drill is very easy to use because of its simple user interface. 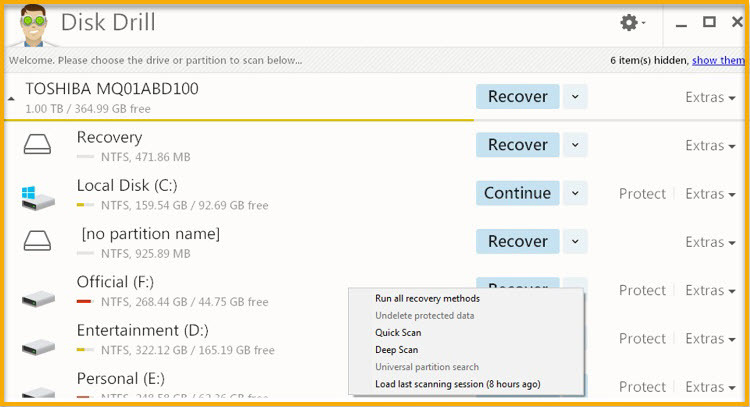 You can run a quick and deep scan on partitions. Like Recuva, Disk Drill as well shows the preview and details before the recovery. Scan data files can be further organized by file type Pictures, Video, Documents, Audio and Archives moreover, this can be sort by date and size which helps you to get the exact files you are looking for in short time. You can save the scan session and restore when you need. Disk Drill runs the scan from where you left previously. And also you can backup the entire drive with Disk Drill. It has a unique data vault algorithm that protects your drive from further data loss, for this it keeps the track of the deleted data and can be recover when you need without scanning the whole hard drive. So that, it takes little much space (in KBs or MBs) which term as database size. MiniTool Power Recovery is another great like others. It helped me a lot. It scans FAT12, NTFS, and HFS+ file systems very quickly. 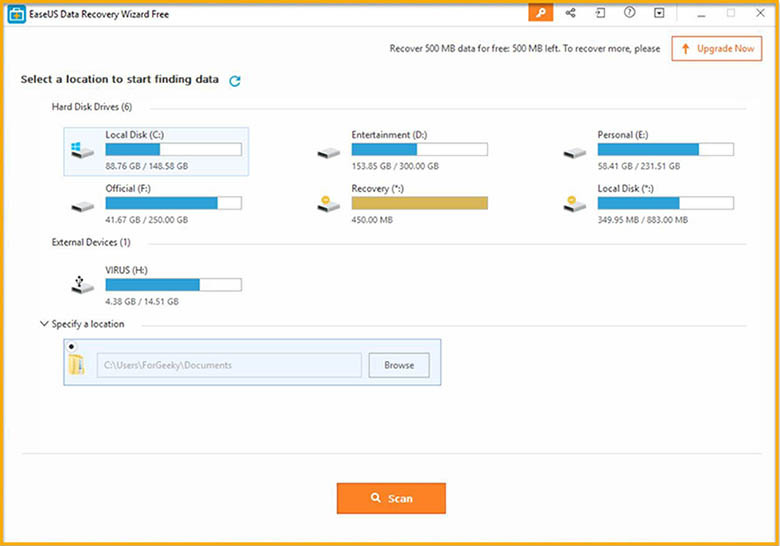 MiniTool can recover formatted, lost or deleted data from hard drive and other removable storage devices. You can filter the files by size, date, and extensions. It helps when your hard drive failure or if accidentally deleted. You can export the scan session and can load when want. MiniTool available for Mac and Windows. Download MiniTool Data recovery. EaseUs Data Recovery is an excellent file undelete program. You can scan specific directory from where you lost your files, So, no need to scan entire hard disk partition. Its interface is very similar to file explorer in Windows OS. EaseUS Recovery structures your data in folder view which helps to identify deleted files quite easily. It recovers files from hard disks, external storage devices (Memory cards, USB) and optical drives, etc. EaseUS Data Recovery offers up to 500MB data recovery in free edition plan. It supports on all Windows as well Mac platforms versions. Download Free EaseUs Data Recovery Wizard. Remember:- Never install any recovery software on the drive that contains loss data, that may cause permanent data loss due to overwriting. I have deleted the files from my SSD is there any way to get them back? Unluckily the answer is no! All the modern TRIM enabled SSD immediately erase the data once delete button pressed. TRIM is the command which tells the operating system the block of data is no longer needed and it wiped out physically. However, it's possible to recover data if the TRIM command is not executed or is not supported by your operating system or the drive. Right now most SSD supports TRIM. The older versions of Windows (Before Vista) doesn't support TRIM. In Mac, TRIM is enabled from Mac OS X 10.10.4. It's pre-enabled if the Mac comes with an SSD. If the SSD is got corrupted, damaged or unreadable in such scenario data recovery is possible with the above software because the TRIM command is not executed by your operating system. In such cases, you can recover your deleted files. Now you knew that the delete button doesn't have the power to erase your data. If you worried about the deleted photos from your mobile phone, be sure to check your Google photos. Your deleted photos might be still available inside Google Photos app If you enable the auto backup and synchronize in Google Photos. Also, check other cloud storage accounts. Still not found, follow the above guide. To avoid further data lost enable the vault from Disk Drill tool.